In the first level of Katamari Damacy, you roll up mundane items that you've seen before. Pushpins, dice, match sticks. The world is your oyster to wad up into your life, as a charming song tells you how smart you are. Katamari Damacy, when it first released in 2004, swept up the world just as the Prince clusters the world into one big ball. If it came out brand-brand new today, it might get criticisms like, "Where's the level variety?" or "Where's the complexity?" And yet, it's a star that maybe shines brighter today than it ever has before. 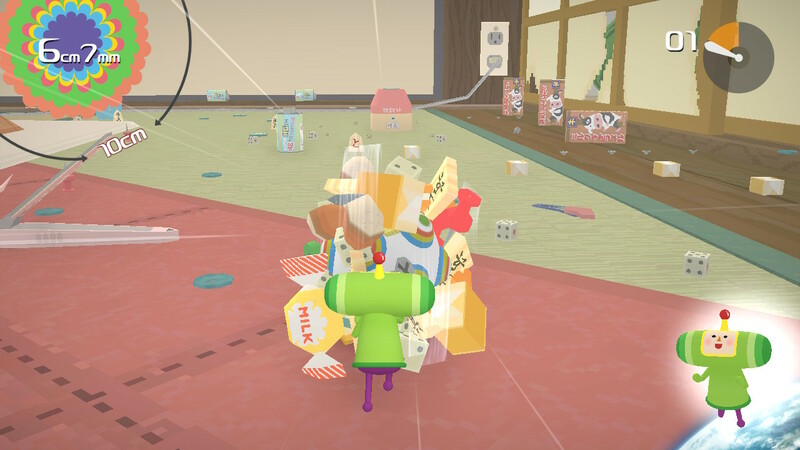 In the Katamari series, you play as cute little Prince, who is tasked with cleaning up his father's mess. You see, his dad, the King of All Cosmos, got a little too drunk and bashed all the stars out of the sky. The news down on Earth reports it without much fanfare; the stars are just gone from the sky, and no one knows why. In Damacy, it's up to you, the Prince, to clean it all up. So you're sent down to Earth to roll up our silly things to make them into stars. Sometimes a level's goal is a specific size, big or small. Other times, it's to build a specific star to help out a constellation, like rolling up a bunch of crabs for Cancer. The bigger you get, the more areas you can reach and the more things you can roll up: be them living things (like animals) or inanimate objects (like frying pans). Get big enough, and even walls can be absorbed. The ethos of Katamari is simple: if you can see it, you can roll it. Eventually. When I still had my PlayStation 3 hooked up, and before that my PlayStation 2, I used to make a habit of playing through Katamari Damacy at least once a year. It's a short game; you can blaze through it in one sitting, pretty much. But it's endlessly endearing. If you're a completionist, there's even goodies to collect in the form of presents. Even when its successors added more and sometimes complicated the core winning formula, Katamari Damacy is a timeless sort of game. And its art style translates to high definition with ease. Sometimes, remasters and remakes have a habit of taking what you remember, and morphing it into something slightly unfamiliar. I had an issue with the Shadow of the Colossus remake, which was technically impressive but erased the atmospheric blur and fog that I loved about the original. The oft-maligned Silent Hill HD Collection on PlayStation 3 committed a similar error (but was much worse about its creative liberties). The Crash Bandicoot remakes in the N. Sane Trilogy tweaked the jumping to being just a bit off. Meanwhile, Katamari Damacy Reroll is a no-nonsense sort of remaster (contrary to its all-nonsense tone). It looks, plays, and sounds just as I remember it. In looking back at screenshots of its PS2 version from 2004, it's basically the same game, only those rough polygonal edges are smoother; the music is sharp as ever. It doesn't even have autosave, as a new pop-in screen tells you once you've finished rolling up your first star. You save as you always have: by visiting the Data house on the Prince's home planet. It's, simply put, Katamari Damacy in 2018. The Nintendo Switch version has a few added bonuses though, namely HD Rumble and gyro control-enabled controls. Unfortunately, I've only had time with the PC version thus far, so I haven't been able to test these new features for myself. (Rest assured that I plan to, however.) On PC at least, it looks and plays great. I've been playing with an Xbox One Gamepad, which feels a bit wrong for all the many years I spent rolling around with Dualshocks. But aside from that, I'm greatly impressed by the remaster. The textures look great in 1080p, save for a few pixelated labels on items. The cutscenes have been remastered in HD too, so now you too can feel the cosmos. While playing Katamari Damacy again, I never had an aha-moment of Now I Remember This Game; that's because it never really faded from memory in the first place. The music, along with the fact that I've played through it a bunch of times, is a big part of that. As a mainstay of the few video game soundtracks I listen to on the regular, the Katamari Damacy soundtrack has been in my iTunes library for as long as I can remember. It's bounced from an imported CD to my library, from PC to laptop to laptop again. From the children's choir of "Cherry Blossom Color Season" to the pop of "Lonely Rolling Star," the Katamari Damacy soundtrack is one of the rare soundtracks that matches the game itself one-to-one: it's as eclectic and unforgettable as a King from space with a giant bulge getting mad at you for rolling up a bear. 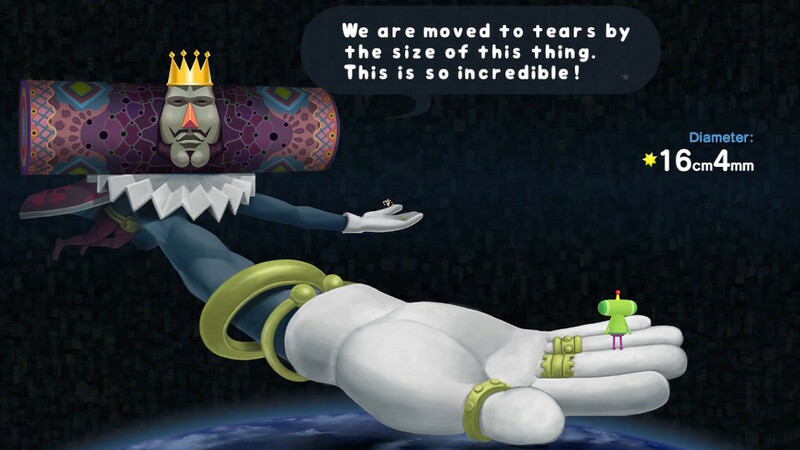 Katamari Damacy Reroll is just as charming as it was when I first played it all those years ago. I wonder that if Reroll is successful, if we can see its later entries get similar remaster treatment—particularly its excellent direct sequel, and the last one Keita Takahashi directed, We Love Katamari. In the meantime as those pie in the sky dreams simmer, we at least get Katamari Damacy again. Tagged with Analyses,	Bandai Namco Entertainment,	katamari damacy,	Nintendo Switch,	PC,	Remaster.